The latest 2017 Trends in Global Employee Engagement report by Aon Hewitt has revealed that global employee engagement has retracted in the last year. Covering more than five million employee responses worldwide across more than 60 industries, the report showed that less than a quarter (24%) of all employees fall into the highly engaged category, and another 39% can be categorised as moderately engaged in 2016. This puts the global engagement score at 63% – slightly under the 65% in 2015. As for Asia Pacific, Singapore’s employee engagement score fell by 4 points to 59% – joining its Malaysian counterparts in being the least engaged among major Asian markets. Singapore’s decline is significant when compared to the 3-point increase last year. Perception scores among Singapore’s Millennials fell by an alarming seven points in the area of talent and staffing — which refers to the talent attraction, promotion, and retention practices of an organisation, as well as its ability to allocate appropriate and adequate resources to get the job done. Perception scores also fell by five points in the area of employer brand. “They must educate their people on how they implement ‘pay for performance’, and recognise top contributors using a blend of financial and non-financial rewards such as development opportunities,” he added. He noted that fairness in reward programmes, along with colleague recognition, is increasingly critical to achieving an engaged workforce in APAC. 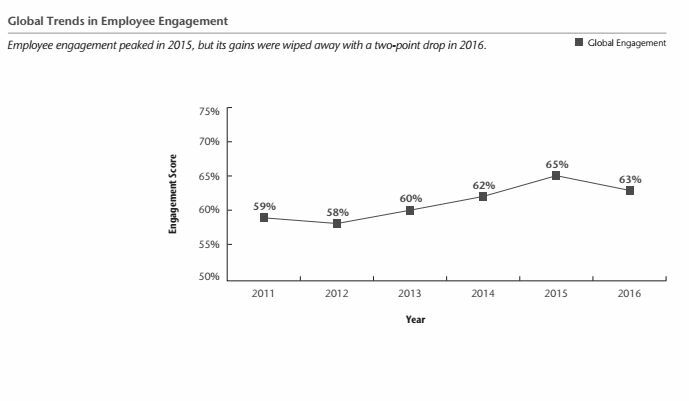 Overall engagement scores for employees in Asia Pacific dropped from 65% to 62% a year ago. Aon Hewitt’s analysis found regional variations in engagement are driven by regional and country-specific economic, political and cultural differences. He wanted the psychological services in managing the country’s human capital to continue to be boosted. ..
Home to over 1,200 staff, the new workspace is powered by Schneider Electric's EcoStruxure solution and aims to be fully carbon ne.. There are also additional family-friendly policies, including 20 weeks of fully paid maternity leave and flexi-working arrangement..